What is Restasis & How to Save On Restasis Cost? Restasis Eye Drops (Cyclosporin) are prescribed to patients to help their eyes with the natural production of tears. In some cases, the inflammation of the eyes can slow the eyes natural production of tears. Over time, the inflammation can cause Chronic Dry Eye. Restasis Eye Drops (Cyclosporine) help provide relief by keeping the eye moist. This medication may be used with other ones that help provide artificial tears. If you are using another solution in conjunction with this one, wait at least fifteen minutes before using Restasis Eye Drops (Cyclosporine) and the other tear products. Restasis Eye Drops (Cyclosporine) have not shown an increase in the production of tears for patients also using anti-inflammatory eye drops. In most cases, the medication works by helping patients to create their own natural tears. 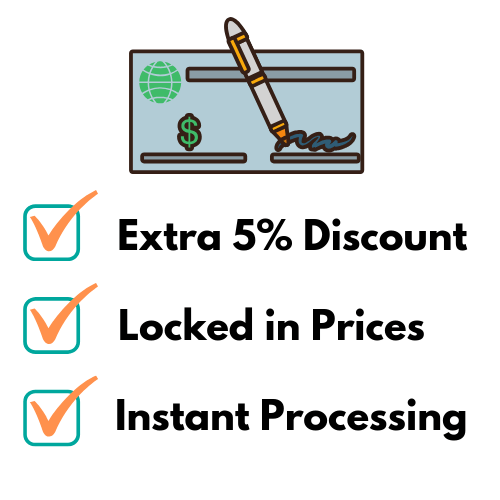 To buy Restasis a prescription is a required to process your order. The active ingredient in this medication is cyclosporine and it is available in a 0.05% strength manufactured by Allergan. 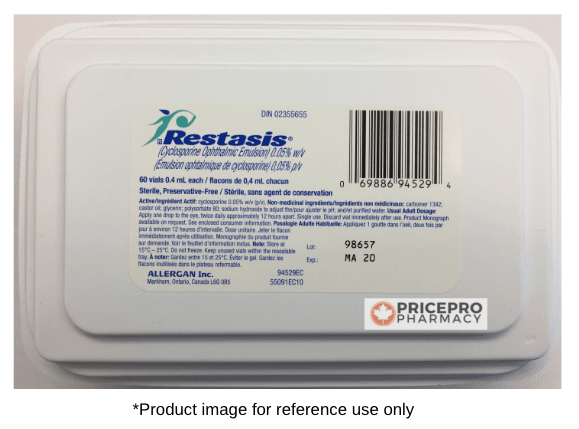 Restasis is available as sterile single-use plastic vials as well as a multi-dose bottle. The single use-vials are packaged as a box with 30 vials or 60 vials and the multi-dose bottle is 3ml(s). 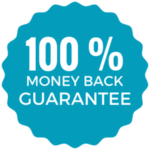 To find the best prices on Restasis, click on "CHECK PRICES" above to compare both brand and generic cost. There is a Restasis generic available from Canada manufactured by Teva which is another affordable option for those suffering from dry eye. For more details on Restasis, click on the blue boxes below to expand more information on: Dosage, Side Effects, Warnings and Precautions, and Interactions. Restasis Eye Drops (Cyclosporine) is typically used with one drop in each affected eye twice daily. This medication may be taken with other solutions of artificial tears. If you suspect an overdose, contact your medical health professional. If it is orally digested, contact an emergency health professional or poison control. This medication is not meant to be swallowed or orally digested. It is intended for use in the eye to help with the natural production of tears. Take our medication on time. If you miss a dose, take it when you remember unless it is too close to the next dose. In that case, skip the missed dose and continue to take your medication as scheduled. There is a risk of ocular burning while taking Restasis Eye Drops (Cyclosporine). 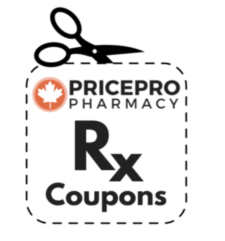 Talk with your doctor about the cost and benefit of taking this medication to determine if risking the possibility of side effects is worth the possible benefit. The most common side effect is simply a temporary eye burning sensation. Some people may experience an allergic reaction to this medication, like tongue swelling, throat swelling, facial swelling, shortness of breath, itchy skin or more. If you experience any of these reactions, stop taking the medication and consult with your doctor. If you experience unusual effects that are not listed, contact your doctor or pharmacist to discuss it. Do not use Restasis Eye Drops (Cyclosporine) while wearing contact lenses. Also, keep the tip of the vial from touching the eye or the area around the eye. There are currently no drug interactions to reference. Talk to your doctor or pharmacist about all of the medications you are taking. If you have an allergy to any of the ingredients found in Restasis Eye Drops (Cyclosporine), do not take this medication.